February 14th is a special day in Sorrento, not only for the celebrations of Valentine’s Day, but, above all, for the celebration of St. Antonino, the Patron Saint of Sorrento. The citizens of Sorrento are known to be very traditional, in fact they’re famous everywhere for their Easter’s processiosn, where they put on in a striking way the death and resurrection of Christ. It all start at the 5 am with the first Mass. The procession start at 9 am with the attendance of various authority. At the end of the procession a Mass will be celebrated by the archbishop Francesco Alfano. The celebration of St.Antonino are not only of religious kind, in fact stands of various kind will hit the streets, giving the opportunity to buy typical food or traditional handmade items. No matter if you want to celebrate St. Antonino or Valentine’s day, in Sorrento the day of February 14th is a magical moment, in the pursuit of sacredness, but also lived with joy and cheerfulness. 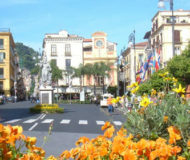 Description: Discover details about Saint Antonino's day 2013 in Sorrento, through religious celebrations and the romanticism of Valentine's day.